Today we celebrate the Feast of Saint Andrew, Apostle of our Lord Jesus Christ. Most New Testament references include him on a list of the Twelve Apostles or group him with his brother, Simon Peter. But we see him acting as an individual three times. When a number of Greeks (or Greek-speaking Jews) wished to speak with Jesus, they approached Philip, who told Andrew, and the two of them told Jesus (John 12:20-22). Since "Philip" and "Andrew" are Greek names, these petitioners may have sought them out. Before Jesus fed the Five Thousand, Andrew said, "There is a boy here who has five barley loaves and two fish, but what are they for so many? (John 6:9)"
The first two disciples whom John reports as attaching themselves to Jesus (John 1:35-42) are Andrew and another disciple (unnamed, but commonly supposed to be John himself — John never mentioned himself by name, a widespread literary convention). After meeting Jesus, Andrew found his brother Simon and brought him to Jesus. Thus, on each occasion when he is mentioned as an individual, we see him bringing others to meet the Savior. Just as Andrew was the first of the Apostles, so the Western Church uses his feast to mark the beginning of the Church Year. The First Sunday of Advent is defined as the Sunday on or nearest his feast. (The way the reckoning was designed, it also means that there are always four Sundays in Advent, including, as in this year, the 24th of December, the Eve of the Nativity. Scotland considers Andrew to be its national saint. Meanwhile, George (23 April), Patrick (17 March), and Dewi (1 March) fill these roles for England, Ireland, and Wales, respectively. George, a soldier, is customarily pictured as a knight with a shield that bears a red cross on a white background. This became the national flag of England. Tradition says that Andrew was crucified on a Cross Saltire — an "X"-shaped cross, which became his symbol and later, the national flag of Scotland. One symbol of Patrick is a red cross saltire on a white background. 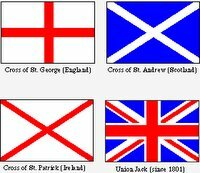 The crosses of George and Andrew were combined to form the Union Jack, or flag of Great Britain; later the cross of Patrick was added to create the present Union Jack. Alas, poor Wales ... it doesn't appear on the British flag, perhaps because Dewi didn't have such a representative symbol. Almighty God, by Your grace the blessed apostle Saint Andrew obeyed the call of Your Son to be His disciple. Grant us also to follow the same Lord Jesus Christ in heart and life, who lives and reigns with You and the Holy Spirit, one God, now and forever.